The warm, soft, powdery and sweet floral scent of this duo will captivate your senses. Revel in green, honeyed undertones with a hint of rose-citrus accord. KORRES Lily of the Valley Eau de Toilette 1.69 fl. oz. Ingredients: Alcohol Denat., Parfum (Fragrance), Aqua / Water/ Eau, Alpha-Isomethyl Ionone, Brassica Campestris (Rapeseed) Seed Oil, Butylphenyl Methylpropional, Citronellol, Eugenol, Geraniol, Helianthus Annuus (Sunflower) Seed Oil, Hydroxycitronellal, Limonene, Linalool, Rosmarinus Officinalis (Rosemary) Leaf Extract. KORRES Lily of the Valley Fragrance Jumbo Body Butter 7.95 fl. oz. Ingredients: AQUA/WATER/EAU, CETEARYL ALCOHOL, PRUNUS AMYGDALUS DULCIS (SWEET ALMOND) OIL, GLYCERIN, COCO-CAPRYLATE/CAPRATE, DICAPRYLYL CARBONATE, HELIANTHUS ANNUUS (SUNFLOWER) SEED OIL, DICAPRYLYL ETHER, SQUALANE, BUTYROSPERMUM PARKII (SHEA BUTTER), PERSEA GRATISSIMA (AVOCADO) OIL, FRAGRANCE (PARFUM), CETEARYL GLUCOSIDE, ALCOHOL, ALPHA-ISOMETHYL IONONE, ASCORBIC ACID, ASCORBYL PALMITATE, BENZYL ALCOHOL, BUTYLPHENYL METHYLPROPIONAL, CETEARETH-33, CITRIC ACID, CITRONELLOL, EUGENOL, HYDROXYCITRONELLAL, IMIDAZOLIDINYL UREA, LACTIC ACID, LINALOOL, PEG-8, PEG-40 HYDROGENATED CASTOR OIL, PHENOXYETHANOL, POTASSIUM SORBATE, PYRUS CYDONIA FRUIT EXTRACT, TOCOPHEROL, VITIS VINIFERA (GRAPE) SEED EXTRACT, XANTHAN GUM. I've had a hard time finding a true Lily of the Valley fragrance that wasn't so delicate that it was barely there...until now. This is a wonderfully fragrant but not overpowering scent, and the body cream is my fave. I quickly ordered a second after receiving my first order as I didn't want to be without. I highly recommend. This is the lightest, most delicate sweetness you will ever smell. I put a spritz on my face to help with anxiety, as well as being flooded with countless memories of what my Grandma wore when I was a child. This is BEAUTIFUL and worth every dime. The lotion is just an added bonus to this wonderful Korres package. Bravo! I love this fragrance. Its a very soft floral. 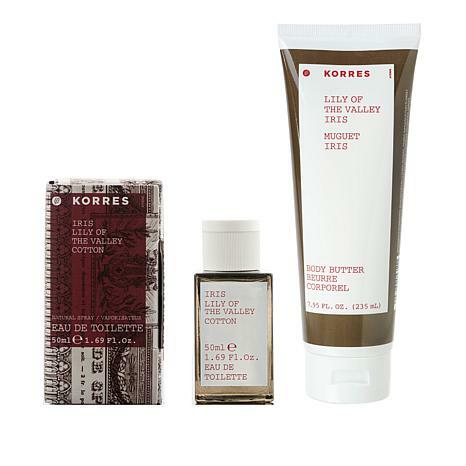 I love lily of the valley scents and although this Korres fragrance has lily of the valley as one of the fragrance oils it is very softened with the addition of the iris and cotton. If youre looking for a fragrance that smells predominantly of lily of the valley then I dont think youll be happy with this fragrance. I also love the White Blossom fragrance and will continue to keep both of these fragrances in my collection. This fragrance is so alluring. My guy cannot stop smelling me!